Philadelphia's promise to become a more bike-friendly place received a boost last August with the opening of the city's first one-way protected bike lane, a 1.1-mile stretch through University City from Chestnut and 45th to 34th streets. The construction of the new bike lane, insulated from vehicle traffic by parked cars and pylon barriers, required the removal of an entire lane of traffic on Chestnut Street. 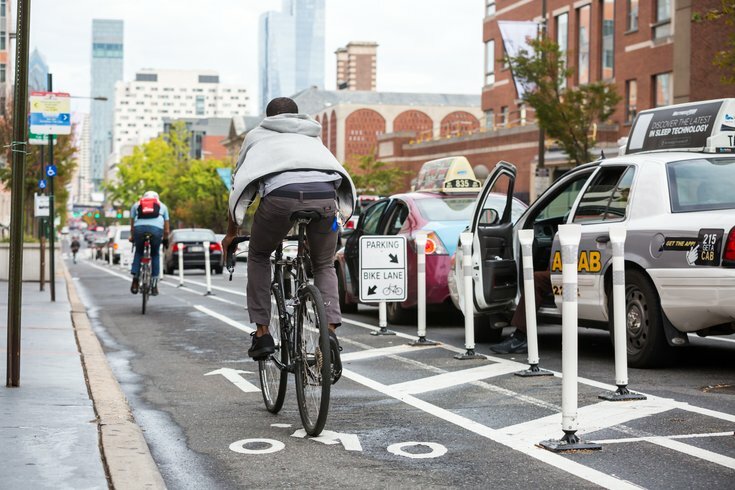 Most cycling advocates applauded the project as a progressive move toward achieving the Vision Zero goals embraced by Philadelphia Mayor Jim Kenney, who has pledged to build 30 miles of protected bike lanes in the city during his administration. Now, with a long way to go toward that goal — the only one other mile of protected bike lane is on Ryan Avenue in the Northeast — the approval process of future bike lane modification projects may get a little thornier. On Thursday, City Councilwoman Jannie Blackwell introduced legislation apparently designed to require stricter terms and conditions for the authorization of new barriers in existing bike lanes. The bill, which has been referred to council's Committee on Streets and Services, expressly seeks to amend the current law to cover "any modification to an existing bicycle lane that would affect the flow of traffic." Sarah Clarke Stuart, executive director of the Bicycle Coalition of Greater Philadelphia, told PhillyVoice she was puzzled by the language, intent and seeming redundancy of Blackwell's bill. "The language is unclear," Stuart said. '"Modify bike lines that would affect the flow of traffic.'" What defines affecting traffic? Who defines it? What if there's no effect? What if it's a good effect, such as reducing speeding? All of these are questions I have." Blackwell's uneasiness with protected bike lanes became apparent immediately after the completion of the Chestnut Street project. At the dedication of the new bike line, the councilwoman told those in attendance she wanted to give the bike lane a three-month "trial basis" to see how it works out. Mike Carroll, the city official overseeing the project, immediately shot down that suggestion, reaffirming that the Chestnut Street lane was not a pilot program and was, in fact, here to stay. Blackwell, whose Third District includes much of West Philadelphia and Southwest Philadelphia, including University City, was not immediately available Friday to clarify the purpose of her proposal. A staffer in her office said Friday morning that the bill is partly a response to complaints from constituents about the impact of the Chestnut Street bike lane, including heavier traffic and parking problems. Blackwell wants to establish more oversight in the approval of future projects. That logic still doesn't quite add up for Stuart. "The thing I think is important to bear in mind here is that streets like West Chestnut were having a crash problem and a speeding problem," Stuart said. "This is a residential street from 63rd all the way to 31st. People live on that street. They walk on that street. It's not Route 1. It's not West Chester Pike. Why shouldn't everyone who lives on West Chestnut Street in Philly have the same experience? That problem needed to be resolved for motorists, bikers and pedestrians." Stuart further noted that Blackwell's bill would do nothing to change the current situation on Chestnut Street. The complaints she's been receiving strike at the heart of why the city is taking action in the first place. "The project was meant to make the street better for everyone," Stuart said. "In order to do that, travel time has been added a few minutes. That's what Vision Zero is about. It's about making trade-offs with speed and convenience and safety. You can't get to safety without making some sacrifices of convenience." What Stuart finds most perplexing about Blackwell's proposed bill is its implication that the current legal framework doesn't adequately engage communities in the discussion and planning of bike lane projects. In each case to date, Stuart said, there has been a city ordinance with the attendant public hearings and community meetings to evaluate the merits of a proposal. That includes the upcoming seven-block protected bike lane along South Street from 21st Street to 27th Street. "The city's intentions are not to do anything without consulting the community," Stuart said. "They weigh the community's desires very seriously. Most certainly there would be public meetings, RCO (register communinty organization) meetings, and consultation with the council members .... I don't see how this bill adds to community input at all. The community input is already factored in and is being done by the city." In fact, Blackwell was fully looped in on the debate and planning process for the Chestnut Street project, Stuart noted. "She introduced the ordinance," Stuart said. "There were hearings. That process was followed through respectfully and diligently by the Streets Department and the Office of Transportation and Infrastructure Systems, and the councilwoman. These kinds of projects take between three to five years to plan." The introduction of the Blackwell's bill comes amid recent criticism of the traffic congestion in and around Center City. In the March issue of Philadelphia Magazine, a first-person piece about motor vehicle gridlock characterized the state of downtown Philly as a "traffic apocalypse," specifically noting the slowdown caused by the one-way protected bike lane on Chestnut Street. In response to that article, the Bicycle Coalition for Greater Philadelphia published a brief analysis of Google traffic data along West Chestnut Street, highlighting the delay of less than three minutes along the protected stretch of the corridor. The response urged greater availability of traffic movement data in order to help contextualize changes in congestion as they align with Philadelphia's Vision Zero initiatives. Public sentiment about the safety of pedestrians and cyclists often hits inflection points when the city is mourning a tragic loss, like the death last November of 24-year-old Emily Fredricks, who was fatally struck in a collision with a garbage truck at 11th and Spruce Streets. She was one of three cyclists killed last year in Philadelphia. The Kenney administration has consistently signaled its commitment to Vision Zero and its desire to expand bike lane protection throughout the city. In 2016, when the Delaware Valley Regional Planning Commission committed $7.6 million in Transportation Alternatives Program (TAP) funds to 11 projects, a $300,000 grant was set aside for protected bike lanes. Ten future projects were revealed at the time, but Stuart said Friday they were only part of the city's proposal to receive the grant, not fully approved plans. Two of those projects highlight how Blackwell's bill could impact future movement on protected bike lanes, Stuart noted. In the case of a project on Race Street from 5th to 9th streets, the proposal would require authorization to remove a traffic lane. Another project on Parkside Avenue in West Philadelphia, installing protected upgrades to bike lanes along the border with Fairmount Park, would not involve any modification to existing vehicle lanes. Under Blackwell's bill, however, the Parkside Avenue project would require authorization via City Council hearings. If that is actually the goal of the bill, Stuart suggests it's an unnecessary step. There will always be direct engagement with civic organizations and council members in the development of these projects, she repeated, and if Blackwell has a problem with the Chestnut Street project, this isn't going to help her with that. "I would ask the councilwoman to sit down with the Streets Department and see how [West Chestnut Street] can be tweaked after looking at the data," Stuart said. "That can happen without this bill and without this language." A spokesperson for Mayor Kenney said Friday the administration is still reviewing Blackwell's bill and did not immediately have any comment on the matter. To Stuart, and to many cycling advocates, the bill comes across as a potential speed bump for Vision Zero initiatives. "The fact of the matter is, it seems like there is a notion that there is some kind of problem that needs to be solved," Stuart said.